Snor at Lakenheath; a fine photo by Jay Ward, who clearly saw it better than Dave, or me. The Dutch name for the Savi’s Warbler is Snor. At Lakenheath Fen this morning I discovered why. It must be due to the fact that this damn-difficult-to-see-bird soon had rows of elderly birders falling asleep as they patiently wait in line. Actually the Google translation service tells us that Snor = v. whir, whirr, drone, hum, purr, whizz, whiz, buzz, which probably has some connection to the strange noise emanating from the reeds just in front of us before a dark shape scuttled through the reeds. “Wake up Dave, I think I’ve seen it” said the guy next to me to his mate. And each time the dim light bulb up top gets brighter. Each spot looks exactly the same! 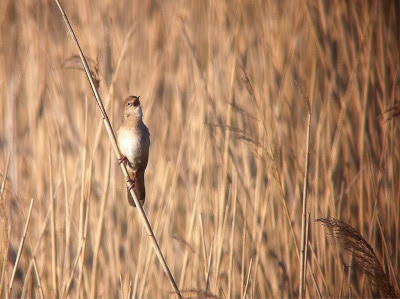 Savi’s Warblers prefer large, tall and dense reedbeds, generally 10+ years old, with a well-developed, often dense, under-storey of old stems, leaves etc, often of sedge or other non-reed vegetation through which these birds walk, climb and hop. They like shallow water that does not flood the dense understorey but they do need water. Scattered willows are optimal but not essential. 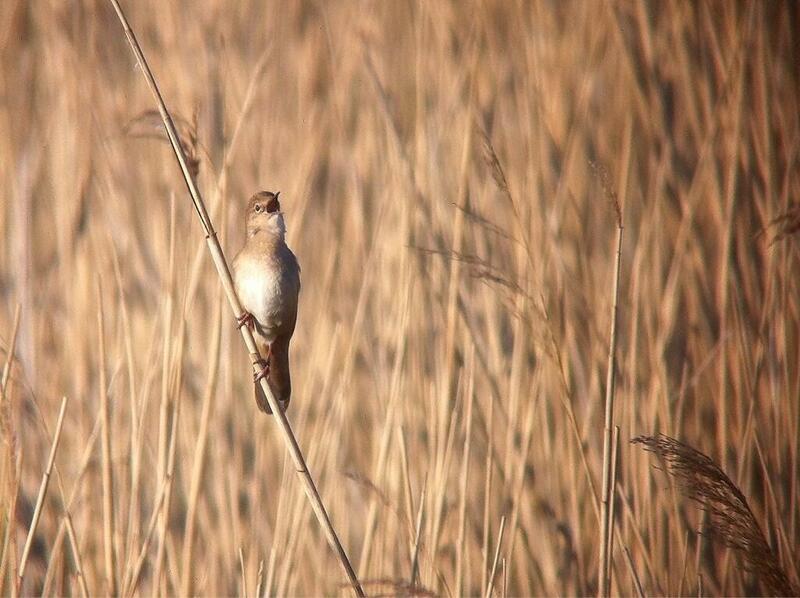 This is an ‘internal’ reedbed bird, it prefers extensive stands of vegetation where ‘edgey’ structure is not essential. They don’t like reedbed management. Their requirements appear to be quite specialised and any old reedbed won’t do. I wandered off happy to have seen a bit of vegetation well, along with a crap view of a brown blob. Adding crap views of Golden Oriole, Bittern and Crane made me very happy indeed. From the sublime to the ridiculous, or is it the other way around? 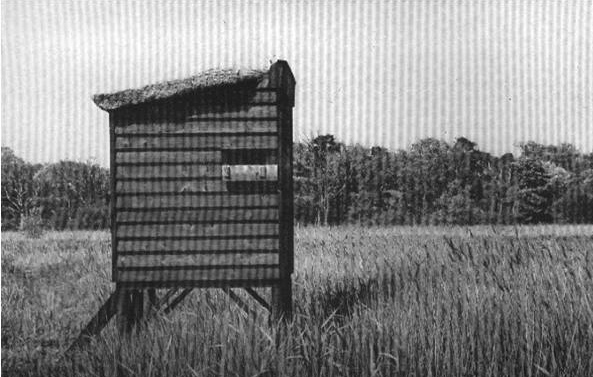 Do we need a clearer view about the design of bird hides on nature reserves? Recently I spent a couple of days with Tormod Amundsen and Elin Taranger, architects and birders from Vardo in Norway. Their account of the visit is here. Biotope is Norways first and only architectural office with special expertise on birds and birding. They design bird hides, shelters, nature trails, outdoor amphitheatres and more. We looked around Bowers Marsh, the soon-to-be-opened next part of the RSPB South Essex Reserve, and considered what sort of hides would be appropriate. After many years of dominance by the wooden box, with its narrow viewing flaps and dark corners, we are now seeing grander designs with expanses of glass and metal. However, these new hides seem to be liked and loathed in equal quantities. 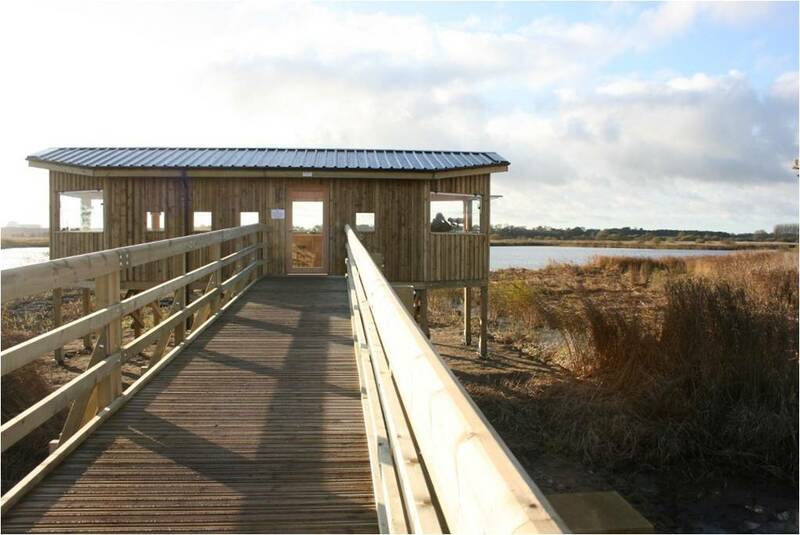 Many of the new hides are open, airey structures that are liked by groups, families and newcomers to reserves. And perhaps that is what is disliked by others; watch a birder enter a hide and they will head for the nearest dark corner to hide away in. There is a clue in the name ‘hide’. It is usually not that the new hide provides worse views of wildlife, often quite the reverse, but something gets under the skin of these hide-haters. However many of these new hides are as much architectural statement as state of the art viewing, and critically, they are not designed by the people who use them. It seems that we need a variety of different types of ‘hide’ that perform different functions. Hides could provide medium or long distance views, high views, low views, close views, complex views, and above all, something to view. 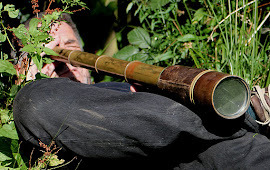 There could be big hides, small hides, photographic hides and even mobile hides. You can’t fit everyone in the same box. Form should follow function. And this is where Tormod and Elin come in. We hope to be working with them some more in the future. Spotted Crakes have been appearing at some of their usual haunts over the last week or so, with the first birds arriving towards the end of April. Often the only indication of their presence is the far-carrying nocturnal ‘whipping’ song of the male. Spotted Crakes return earlier in spring than perhaps many people expect. In the Mediterranean countries, the peak of passage is in late March and in the Netherlands, they can be present and singing from the first week of April if the weather is right. Birds singing later in spring (May/June) may be arriving from breeding areas elsewhere in Europe. Spotted Crakes breed on lowland fen-like or marshy wetland habitats with shallow fresh water interspersed with extensive stands of low plant cover, rich in invertebrates. They favour areas of sedge, rush, grass and reed with 10-20 cm of water over up to half of their territory. Lightly managed areas, either by occasional cutting or grazing (outside the breeding season) are preferred as they maintain an open-structured vegetation. On one reserve, where occupied areas were ‘protected’ by removing all grazing, such areas were subsequently deserted, presumably as the vegetation became too dense. Annual occupancy of sites and singing behaviour are still poorly understood in the Spotted Crake. Certainly there seems to be considerable annual variation in numbers at regular sites, with some evidence that this is at least partly related to site condition, particularly water levels. Checking out a couple of regular sites this week, conditions looked poor with very low water levels. The annual recorded total of 10-30 singing birds is probably an under-estimate. So if you know a suitably wet marshy site, get out over the next week or so and listen from sunset until past midnight, ideally on a warm, dry and calm night. Go on, get out for a whipping. Pics above - Spotted Crake feeding in typical shallow water, marshy habitat. Lower: another regular site, but too dry this year. After a long cold late winter, spring finally arrived in a wave of migrants, with interesting reports of breeding birds now arriving thick and fast. Spring also usually means a flurry of site visits for the Grumpy Ecologist and this year has been no different; from East Anglia to the Insh Marshes and across to Wales. The Nene Washes are always a highlight in the spring. Reports of a gas gun keeping Cambridgeshire residents awake at night were tracked down to an over enthusiastic booming Bittern in a fenland drain. The breeding success of waders on the washes has been poor for the past three years, due variously to drought or flood. Fingers are crossed for a good breeding season this year. The cold and wet winter has left many wet grasslands in good condition; short swards with a lack of winter growth and brimming pools and ditches. The trip to the Nene provided evidence of the seasonal changeover. 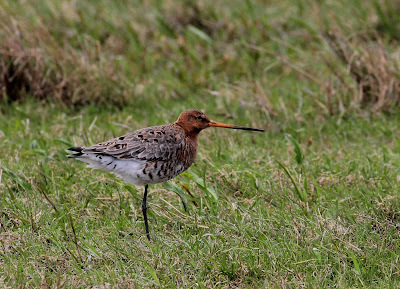 While 800 islandica Black-tailed Godwits huddled together around the pools, 30+ pairs of limosa noisily ‘wickered’ and chased around the fields. Snipe chipped and drummed over a feeding flock of Dunlin, Ruff and Ringed Plover. Garganey zipped past the last few Whooper Swans. Over at Ynys-hir, an early morning visit coincided with an arrival of Wood Warblers, trilling through the woodlands. Pied Flycatchers and Redstarts were already in good numbers. All three species, typical of these West Atlantic Oakwoods, were seen well from the Ynys-hir canopy hide but the highlight was a Goshawk gliding and twisting through the still bare trees with its entourage of squawking crows marking its passage. Wood Warblers have declined by 60% in a little over a decade (BBS data), and over a longer period have disappeared from many eastern and southern haunts, yet the reason for this decline is still unclear. Potential causes include changes in woodland structure, increased predation and a phenological mis-match between egg hatch and the peak of caterpillar emergence. Studies in Wales have failed to point the finger at any of these and indeed have shown that the timing of Wood Warbler breeding can track the annual variation in caterpillar emergence. Perhaps the answer lies in Africa.